Researchers from Freie Universität Berlin used eye tracking in a study that revealed the incidence of negativity biases among different cultures by testing reactions to facial expressions. "Negativity bias" refers to the faster recognition of, and reaction to, expressions of negative emotions such as anger or fear compared to positive or neutral emotional expressions. It is possible that the negativity bias is innate and could therefore appear in early infancy, independent of cultural backgrounds. It is also possible that it could be shared with other species, such as closely related nonhuman primates. In this study, within the field of evolutionary and comparative psychology, eye tracking was used to study negativity bias in varying cultures by measuring and analyzing fixation times on facial expressions. It was investigated whether both children and adults of two very distinct cultural groups (Germans and a hunter-gatherer group, the ≠Akhoe Hai//om, in Namibia) fixated facial expressions of negative emotions faster, more often, and for a longer duration compared to positive or neutral expressions. The aim of the project was to characterize the potentially evolutionary functional basis of the negativity bias, its cultural dependencies and development over lifespan. It was assumed that both young children and adults of different cultures should react more (e.g. show increased looking times) to negative emotional information compared to positive or neutral information. At present a total of 31 preschoolers (between 4 and 5 years), 60 school children (between 7 and 9 years) and 40 adults have been tested. This is, however, an ongoing study with only preliminary results so far. 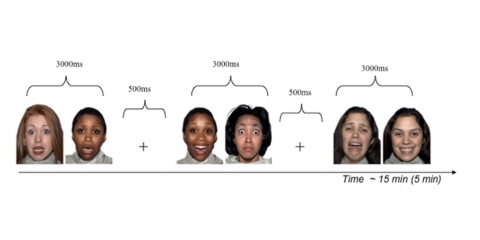 Two negative facial expressions (fear – high arousal and sadness – low arousal), one positive facial expression (happy) and a neutral face were presented to the viewers. For each facial expression, two sets of stimuli (Caucasian – "white" and Afro-American – "black") were included to see whether faces of different ethnic groups are processed differently. These faces were obtained from the NimStim Face Stimulus Set (MacBrain Database; Tottenham et al., 2009). The experiment was conducted using the Tobii T60 eye tracker to measure time spent fixating on each image (Figure 1). A 5-point calibration was used for adults and school children and the manual infant calibration (5 point) for preschoolers. The facial expressions were always presented in pairs. Each pair was presented for 3000 milliseconds followed by a fixation cross before the next pair was presented. Because of childrens' shorter attention span, only 56 such pairs were used for children, resulting in a total length of 5 minutes per session compared to 240 pairs for adults resulting in a total length of 15 minutes per session (Figure 2). Time points were measured every 16.67 milliseconds (60Hz) to estimate the point and duration of a fixation. Any fixation within an area of 50 pixels that lasted longer than 100 milliseconds was included in the analysis. For power supply, a small mobile generator was used, which proved to be very reliable. Stimuli were designed with the Tobii Pro Studio software. Raw data was extracted by using a self-written Matlab script. To do so, each picture on one stimulus was defined as a separate area of interest (AOI). Fixation duration, number of fixations and scan path were analyzed with this script. Statistical analysis was conducted using the numerical computation software SPSS by importing the Matlab outputs. 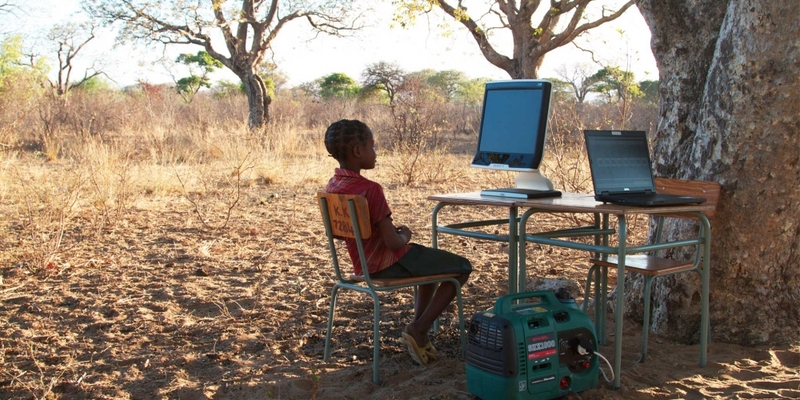 Even without a regular power supply and under difficult environmental conditions the Tobii T60 worked reliably, which assisted the study a great deal. Duration and rate of fixations were measured for two different sets of comparisons. First, the mean fixation rate and duration for each facial expression were compared to any other facial expression, e.g. fearful faces were compared to sad, happy, and neutral faces separately. Second, the mean fixation rate and duration of one particular facial expression were compared to all other facial expressions together, e.g. fearful faces compared to "the rest" (sad, happy, neutral combined). Concerning the first set of analyses, it was found that preschool children and adults in Germany, as well as school children of both cultures, fixated on fearful faces more often and for longer than on neutral faces. Only adults differentiated between the two negative facial expressions and fixated on fearful faces more often and for longer than on sad faces. However, fearful faces were not fixated on more often and for longer than happy faces. For the second set of analysis, both children and adults in Germany, as well as school children of both cultural groups, fixated on fearful expressions more often and neutral faces less often compared to the "rest", but no differences were found for the other comparisons. Overall, results indicate that the concept of "negativity bias" might not be appropriate to describe the tendency to react to negative emotions stronger than to positive emotions, but that it would be more useful to refer to a "fear bias" since sad facial expressions were fixated on to a much lesser extent. The next steps will include the investigation of angry faces since, from an evolutionary perspective, it might be more useful to react to angry faces as they communicate an immediate threat to oneself. Furthermore, another line of research will address the question whether participants process stimuli with facial expressions from their own ethnic group differently compared to stimuli from another cultural group. Finally, in collaboration with Fumihiro Kano, a similar design is currently being used to investigate whether great apes also fixate on facial expressions of negative emotions faster than on positive or neutral emotions.